Let me start by saying no tent is perfect for everyone...but this one is perfect for me. The Hilleberg Unna is an exoskeletal design (poles on the outer) as all Hillies are, making it much easier to set up in wet snow or rain. The interior of the tent is never exposed when setting up as it is already attached to the outer fly with toggles (my word, not sure what Hille calls them!). I'm not completely sure why every other tent manufacturer hasn't started this yet, but they should. I have had this tent for about a year now and had the chance to use it at least once in every season. I live in Ontario, Canada, and do the majority of backpacking in Northern Ontario. Temps ranging from I believe -28c was the coldest, to 26c. I am 6 feet, 160 lbs and often travel with an 120 lb Mastiff and 100 lb Eurasier. In my opinion this is the perfect solo tent and that starts with the kerlon 1200 fabric. If you haven't already, order the Hille catolog (free), it comes with fabric samples of the kerlon 1200, 1800 (its beefier brother) and standard ripstop nylon. The first thing it encourages you to do is try to rip the three samples. 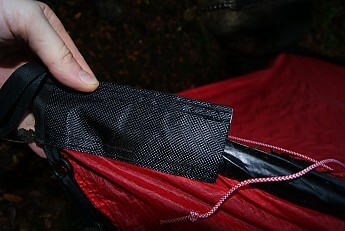 The ripstop is easy but I was unable to rip the kerlon and eventually took a knife to it out of curiousity. The durability of this fabric is amazing. I bought mine used at a cheaper price and it looked untouched. I've put it through some tests, still untouched. The next positive is the ventilation options. There are lots of different ways to set up the two (inner and outer I mean in this case) doors and the one window to ventilate. From battening down the hatches to a free view on a starry night. It has what I call a little rain hat, again I'm making my own descriptions, to allow you to ventilate through the fly door while still leaving it closed. This is a solo tent so having only one vent does suffice, I wouldn't want to get two people in there unless it was an emergency. Almost all my trips are myself and two large dogs (100lbs plus each), and condensation has never been an issue. The last positive is a couple little things that put this tent, and company, head and shoulders above. 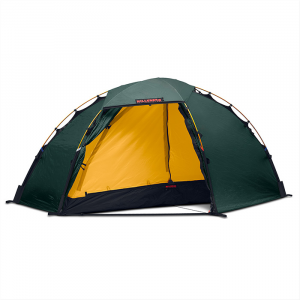 The tent has the ability to double up poles. I own both the 9mm and 10mm DAC poles and have used, albeit overkill, both sets together in heavy, wet snow. I have no idea the weight these two sets could bear but would bet my life on them rather then most other 4-season tents. I see no expense spared in this tent and you can see the quality in the metal tensioning strap and re-enforced pole pockets. Interior space or vestibule? This tent lets you chose. There is no built in vesti, but rather enough interior space for a solo trip plus gear. If you want you can detach the toggles and make less interior space and have a vestibule. 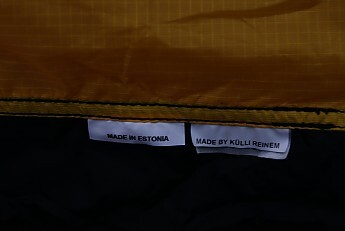 Another of my favourite features is that worker that makes your tent (one worker does all the parts — start to finish) sews his/her name on the tent. In my opinion that brings them a sense of accountability to the product they personally, as well as the company, are sending out. Very little. But being subjective the V stakes included are nothing special, standard quality. Don't get me wrong they work, and I havn't broken one, but they are not any better then most standard included stakes. 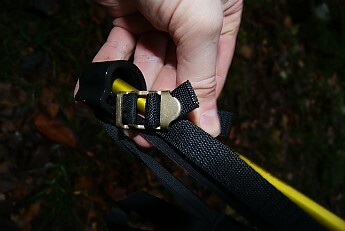 I've read Tipi's concern with the elastic that attaches the inner and outer fly and I think its a valid one. It certainly has to be the "weak point" if this tent has one. I am keeping my eye on that, no problems yet. Price, has got to be a negative, but I bought mine used and at 300 dollars with both sets of poles it's a steal. Last is the specs, it is slightly smaller in all dimensions on the inner then on the website (91*44*40 inches) as the measurements were taken on the outside and the inner uses about an inch and a half of elastic to connect. Step #1 — Save up, collect pennies, go in the fountain and fish for quarters, do what you have to do to get the money, and then buy the Hillie that best suits you. Step #2 — Never have to worry about your tent. Step #3 — Enjoy when your friends have to look for a new tent again, and again, and again. I've put up more pics in an album on my profile but didn't want to bog the review down too much. Thanks for the link and your good pictures. I updated my Keron review with a pic of the elastic permamently deforming which is a problem after several years of hard use. It's a problem which needs a solution. Just back from an horrendous trip. 100km per hour winds in a relatively flat landscape - so there were few places to shelter. This tent was amazing. While I was cooking dinner I watched the tent dispatch the winds that the trees bowed to. I own five tents. 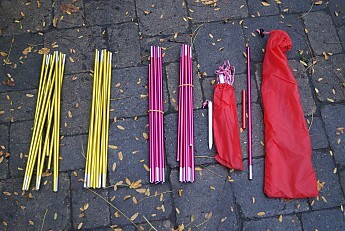 This is what I use when I need a light, tough tent. 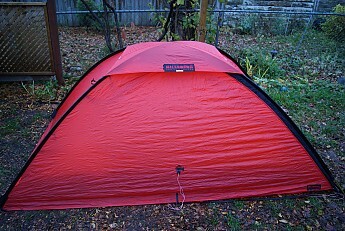 I have used this tent under various conditions for a few years now. I do remote backcountry camping. At my favorite site my really light MSR ... nearly caused me serious danger. That's when I decided to pay the extra money for the Hilleberg. The conditions that caused difficulties for my MSR — it doesn't really matter which tent, they all suffer the same difficulty — were simply glided through in the Unna. 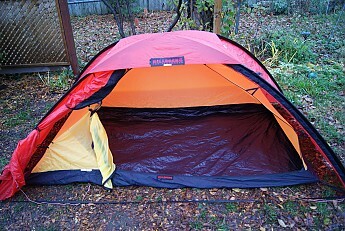 Eight hours of cold damp fog — no problems in the Unna big probs for MSR and most non-4-season tents. My Bibler would treat these condition likewise with disdain, but the extra kilo is not welcome at my age. The quality of construction is unbelievable. It's like camping in a Rolls Royce. Superb! It pitches as one unit. All tents should be able to do this. Condensation is not an issue for me. It is very stable. No vestibule is no problem for using this as a 1-person tent. 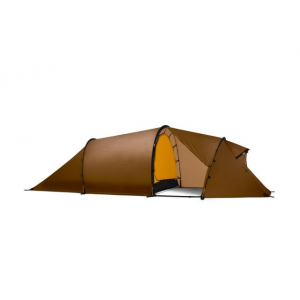 Hint: buy a mesh inner from Hilleberg to make this tent into two: summer and winter! I should have never bought all those other expensive tents. This one with two inners would have covered all bases. 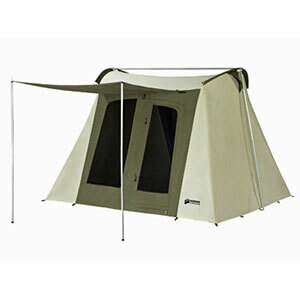 When the weather turns really bad you'll be glad, safe and comfy inside your near indestructible Unna. Absolutely fantastic tent! The only downer: I am 6' 2". When I sit up straight I touch the highest point with my head. 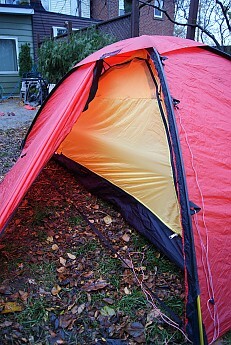 Please, Hilleberg, add 2 cm to the interior peak height... Maybe 4cm that would cover everyone except basketball players! 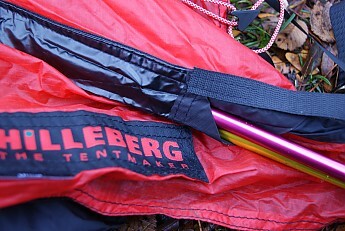 Congratulations to Hilleberg for one of the best designed and built tents on the market. Bravo. Just back from a trip which had a night with 8 hours of fog that turned into misty rain in the morning. When I woke up I felt the inside of my Unna. Dry as a bone. Wonderful for those very poor conditions. Even my boots, which were between the inner and the outer near the door, were dry! Amazing. In other tents I own, that fog came in under the outer and drenched everything outside the fabric inner. 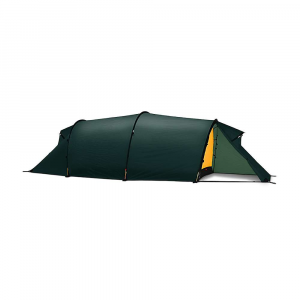 The Unna is a great tent for bad conditions. One addition of a rather obvious comment. 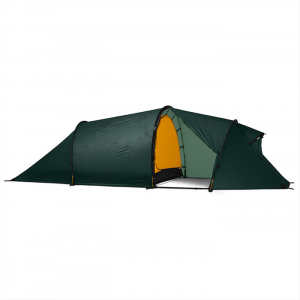 Because this tent can accommodate two people there is ample room inside the bedroom for stashing your pack if you are using it as a one-person tent. There is also plenty of room between the inner and the out for boots, gas bottles, and other items you would rather not move into the bedroom. Hard to see but on the inside of the outer at the front and back of the tent, there are toggles that can be used to raise the outer from the ground—useful in hot weather by increasing ventilation. I agree. I have the jannu and have never been more pleased and trustful of a tent. I must admit it is slightly heavier than most of my other tents but beleve me the space is priceless especially whe the wife and dogs come along.long story short hilleberg tents are king. Just back from 100km/hr camping trip. Glad I took the Unna. Nothing else would have survived. Thanks for the update, Denis. I'm mostly desert hiking. 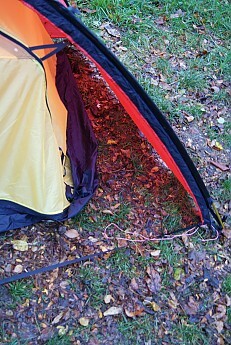 Great tent, but I suspect rock dust has eaten the zippers. This probably won't be an issue for most of you. I've gotten 6-7 years out of my Unna. I've pretty much said what I think about this nice tent. Not for desert type environments though, in my opinion.